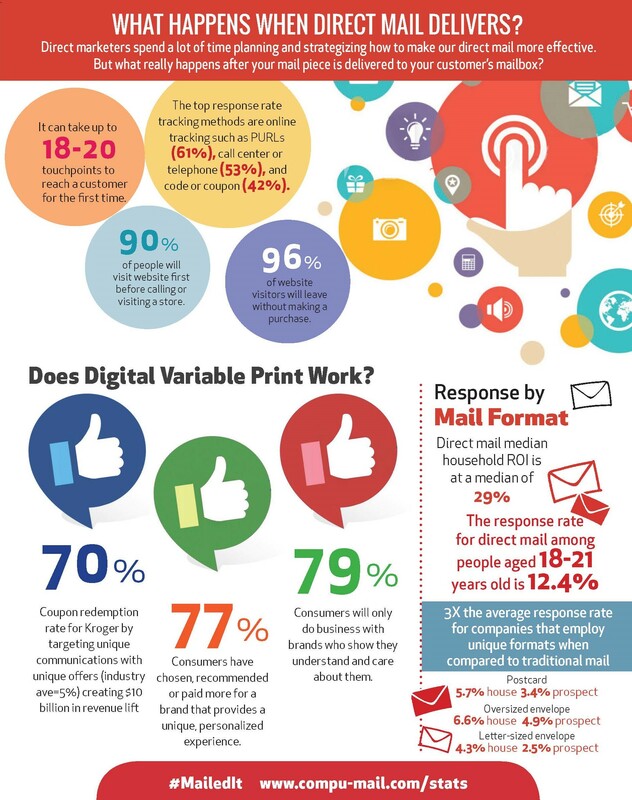 INFOGRAPHIC: What Happens When Direct Mail Delivers? Your mail piece reaches its intended recipient. Download our free infographic to see what happens when direct mail marketing campaigns hit your customer's mailbox. How long it takes to reach a customer for the first time. The top response rate tracking methods. How much of an impact personalization has on the direct mail experience. Average response rates for the millennial generation. Bonus stat: Using personalization in variable direct mail printing lifts response up to 50% or more. *These stats were collected from various sources, including the Data & Marketing Association (DMA) 2017 Response Rate Report. A full list of sources is available upon request.